If there’s one thing that piques our interest, it’s a toddler with mad skills, so it’s hardly surprising that tiny Sam Blewett has caught our eye. Two-year-old Sam is the son of former Australian test cricketer, Greg Blewett and his uncanny knack for swinging a golf club has sparked much excitement – and his very own Twitter and Facebook accounts. “2 years old and born to golf. Follow Sam to the PGA Championship 2034!” Sam’s Facebook page quips, but honestly, we wouldn’t be surprised if the little guy makes it happen. Sam’s talent for golf showed itself pretty early on and he’s now developed quite the following, and the ability to draw a crowd, his mum explains. “We go to the park out the back of the house and people just stop and watch. They cannot believe their eyes when they see him hitting balls. He will always have a little crowd around him”, Katheryn Blewett told Adelaide Now. This tiny boy is a freaky natural, and obviously completely golf-obsessed. He picked up his first (plastic) club at 15 months and has been swinging ever since. Dad Greg says Sam’s penchant for golf showed itself very early on as the pair took in some father-son telly time. “Every time I clicked over to the footy Sam would grunt, like he was cranky,” Greg said. 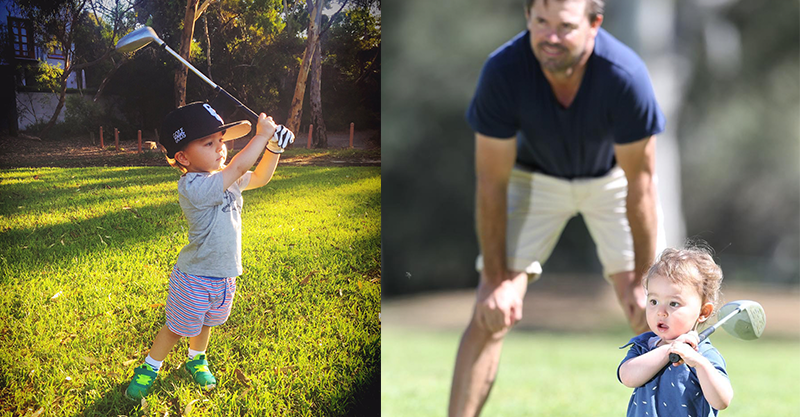 Luckily Greg is as golf-obsessed as his son, so these two make the perfect (pro) pair. Sam’s mum and dad seem to be nurturing their son’s talent in an excellent and dedicated way. Sam’s social media accounts are delightfully chock-full of videos showing trick shots, swing practice and general golf-y larking about. They also reveal that nothing is safe from Sam’s golfing at Chez Blewett, as fruit and vegetables become club and ball and the family’s ice-dispensing fridge an opportunity for a bit of a chilly swing. Sam loves golf so much, he even sleeps with his golf balls. It’s plain to see that this little guy has an excellent golfing future ahead of him, with the support of his mum and dad. See you at the 2034 PGA Championship, Sam!